Here is a brief video of world figures and ordinary folks paying tribute to Nelson Mandela. 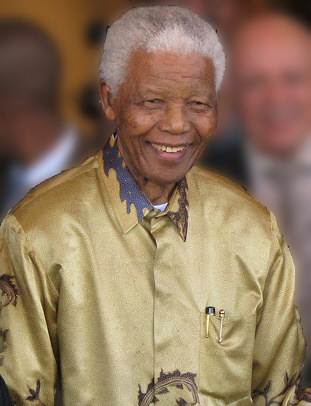 What are your thoughts and feelings about Nelson Mandela? Please share with us. The most important lesson I learned from Nelson Mandela is forgiveness. If we cannot forgive others, we will never know peace. I understand that forgiveness is the hardest act to perform for most humans, yet those who do forgive experience a powerful sense of peace, in body, mind and soul. Nelson Mandela will always be remembered as a man of forgiveness and peace. Thanks very much, Joanne. He will indeed be remembered as a man of forgiveness and peace — a powerful role model for us all. A cozy cup of tea, snow falling outside my window and thoughts of peace and forgiveness inspired by Mandela : a nice way to begin my day. . Truly was he a Strong and Gentle Man and a Great Human Being. The world will miss his physical presence, but his energy is here forever. The greatest tribute we can give Nelson Mandela is to continue his work of Change and Peace. Thank you very much for your tribute to this great man. Here was a remarkable man who knew who he was and his life purpose. Twenty-seven years of incarceration never extinguished his incredible spirit, but fuelled his passion, his light blazing brighter than ever. Always an inspiration and a fine example of finding and following one’s passion and purpose. Thank you, Sarah. He certainly was a magnificent role model for government leaders, and for all of us. May our world leaders learn his path! Thanks very much, Susan — especially for the links. I agree with you — our world leaders could surely learn much from him. So beautifully said Mikala – thank you for those words. In a sweat lodge I once had a vision of Nelson Mandela dancing with a little First Nations boy and his grandfather. They danced in a circle around a fire and the love I experienced during that vision cleansed something deep within me. As I look at his image I marvel at what love can unravel and I pray the Shamans of Light bring him magnificently to the next journey. Thank you Mr. Mandela for showing us who we can be. AN ANGEL IS GONE FROM OUR MIDST. . THANK YOU, NELSON MANDELA, FOR SHINING YOUR NOBLE VISIONARY LIGHT INTO OUR WORLD. YOU STOOD TALLER THAN THE REST OF US. WHAT A THUNDEROUS WELCOME HOME YOU MUST BE RECEIVING NOW. PLEASE CONTINUE TO GUIDE AND BLESS US FROM YOUR NEW PERSPECTIVE. THE OUTPOURING OF LOVE FOR YOU THE WORLD IS EXPRESSING NOW FOR YOU IS ALSO HELPING TO EXPAND THE HEART OF THE PLANET AND IS YOUR GIFT TO US. I will never forget the day you came to Yankee Stadium. What a blessing to be there with you – to see you, to hear you, to stand together in joy WITH YOU. ALWAYS AND FOREVER I LOVE YOU FOR DEMONSTRATING WHAT TRUE COURAGE, LIGHT, JOY AND LOVE IS. YOU OVERCAME EVIL WITH GOOD. He will be sorely missed but his energy lives on and the memories of his life and what he did. Let us hope he is not soon forgotten. I thought it was interesting in a comment from Colin Powell on CNN today regarding Mandela. To paraphrase, he said he wondered how different the United States might have been if JFK would have lived out the rest of his life like Nelson Mandela. Maybe, we wouldn’t have had as much racial encounters and struggles to the degree we’ve had. Thank you to Susan for sharing the video of song and music by JOHNNY CLEGG & SAVUKA~ASIMBONANGA. I loved it and made my heart sing. A beacon of Light in the darkness, a distributor of hope and faith in the impossible, filled with Love and Joy that conquers all. How can you not revere, love, and open your heart to one who changed the world through and with Creator essence. He is and has been a Truth to emulate. I will miss his presence, but I am joyful he will suffer no more. Have a great welcome home celebration, my friend! Thank you very much, Mikala!